In the early 90s, and if your family didn’t have a lot of money, the best way to see a movie was to borrow one from the local library. Especially in the summer, my sister and I would choose from limited titles on the small shelves to entertain ourselves with while our parents were at work, or for times when the kids in the neighborhood weren’t free to play. We’d pick classics like Abbott and Costello, Johnny Weissmuller’s Tarzan, or sometimes a newer release like Memphis Belle. And the library seemed to have a lot from the 70s as well: The Sting, Thunderbolt and Lightfoot, Paper Moon. After all these years, I never revisited Paper Moon, until now, and I’ve got to say, it still holds the same magic as it did was I was ten. Driving through the dust bowl during the Great Depression, trying to make a quick buck, is Moses Pray, a rambling con artist who sells Bibles, swindles money, and does just about whatever it takes to survive in this upside-down world. Mos makes a quick stop at a funeral, where a women he once knew fondly has died, leaving behind a lone child. The girl needs to get to her aunt’s in Missouri and for someone to take her there, a task Mos is only willing to undertake if there’s a profit in it for him. The girl’s name is Addie, she looks more like a boy, and she’s convinced that this man is her father. Together, they head cross-country to deposit Addie in her aunt’s arms, but find along the way that they actually make one hell of a team. Magic; I’m not sure what other word would apply. Perhaps you have to already love 70s films, that unique vibe they were created in, that era of experimentation that made them special, and how they can still speak to us today. Even done in black & white and set in the 30s, that 70s mood comes through, and I can’t get enough of it. But putting that aside, this is one fine film, from the music to the scenery, from the road trip mentality to the cast of recognizable faces that pop up unexpectedly. Madeline Kahn, John Hillerman, even Randy Quaid; it’s an enjoyable who’s who. Real father/daughter pair Ryan & Tatum O’Neal create the spark though, and keep the film burning from start to finish. They are hilarious, heart-breaking, and ultra-realistic, weaving a tale that could be transported to any time and would speak just as loudly. 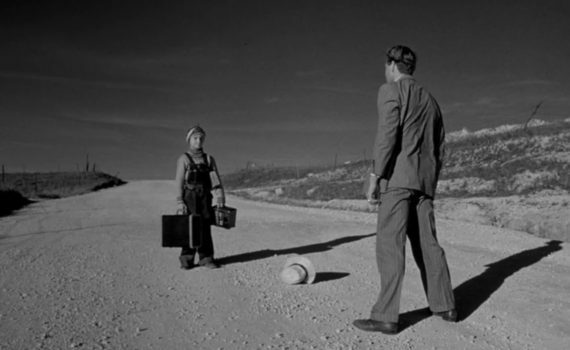 If you’ve never watched Paper Moon, please give it a shot; I don’t think you’ll be disappointed.